dulling the dainty points in transport. I slowly slide my drawing into my storage slot in the studio where it will rest overnight until I slide it back out, replace it on my easel and pore over it some more. I schlep my backpack (books), water (hydration), tea (caffeination), brushes (to partially erase charcoal marks), maulstick (to keep my hand and sleeves from touching the drawing as I work), skewer (for measuring), charcoal box (for hoarding as many sharp pieces of charcoal as possible), sandpaper (for sharpening), and erasers (for absolution) up to our third floor studio. I have an hour to heat up my lunch of delicious leftovers, use the restroom, stretch my legs outside if it’s nice and read art books. Then a serious struggle recommences. I’m drawing a cast (a copy of a classic sculpture) of Julius Caesar and it is the kind of ambitious, spirit-breaking project that will either become a wonderful accomplishment or a miserable defeat. Either way, I’m learning, I’m winning. But there’s no false modesty when I say we’re probably looking at a miserable defeat. I’ll keep you posted. When Caesar and I call a truce for the day, I either work on a freelance project or go home and cook dinner with Emmett. Shower. Feed cats. Read. Ten p.m. bedtime! Then I wake up again and go out to win the day, the same day as yesterday with a little more charcoal added to each of my projects. The learning is intense and the learning curve is steep but this is my kind of heaven. On Friday, our three week pose in the life room, the longest of the year so far, ended. Three weeks to draw one model leaning on a podium? you ask. Yes, and it was not enough! I spent the first week getting the drawing anatomically and proportionally accurate while trying capture the grace of the pose. 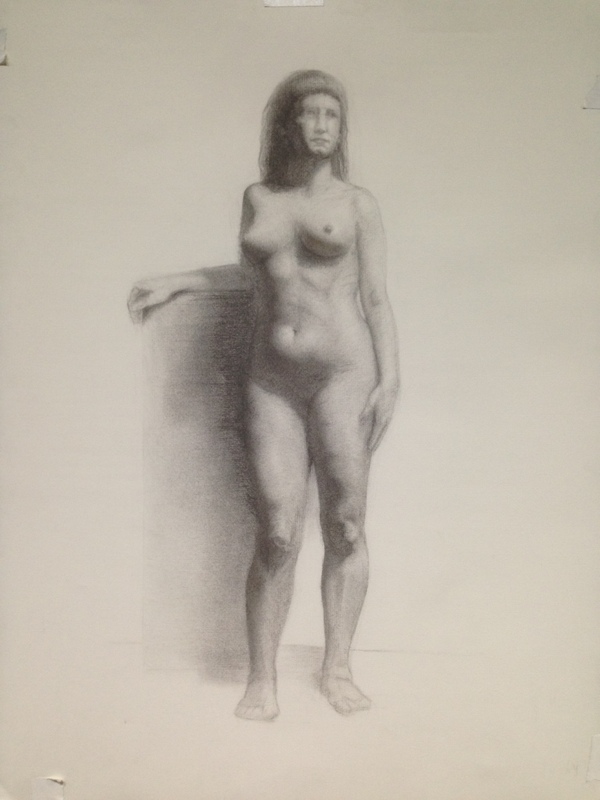 The second week I worked on the accuracy of the shadow shapes and started to turn form on the legs. Last week I feverishly rendered (turned form) on the rest of the body. I ran out of time for the face and the feet, although I did make a vague attempt which actually decreased the success of the piece I think. Better to have left off the face and feet than to have rushed after striving for high sensitivity the previous three weeks. Life room is the best part of my day, aside from sitting down to dinner with Emmett. Cast drawing is like eating your vegetables, but drawing from life is like eating at your favorite restaurant. At least it is to me. The atmosphere can be intense because of the time limit on progress each day, and because we’re all stressing about pacing for the long haul — slow down, go for accuracy and sensitivity, but don’t let the day get away from you. The pose that ended Friday was beautiful. Her weight shifted to her right hip allowed a flow of cascading shadow shapes on her right side. Her left side stretched long in reaction to the curled right side and her chest extended proudly like the prow of a ship. I was one of the last people to choose a spot because I’m a first year student and we give priority to seniority. When it was my turn to choose there was inexplicably a place nested in with the fourth year students that no one had taken. I was inspired by the pose and shadows from this angle and glad to practice drawing the front of the model for a change. When I look at the progress, it’s remarkable how much I’ve learned since I first set up my easel six months ago. I look at the final day drawing with wonder. I haven’t quite nailed the magic of turning form in this drawing but I marvel at the effect anyway. I’m also overwhelmed by all the flaws I see and how much work it will take to learn the skills that could fix this drawing. As of today, I couldn’t really improve the drawing in any meaningful way given extra time. I don’t know how. I could struggle with the face more (and really really really want to, but I promised myself I wouldn’t) and the results would be negligible or worse. I only have three months left of my first year in the atelier. I can’t believe it. We have two more long poses to draw in the life room and I need to finish this cast drawing and do a master copy drawing. I’m thinking of studying one of Prud’hon’s, whose drawing is the featured image at the top of the post. I love the way he links his shadow shapes to great dramatic effect. I have three months left of charcoal and then next year it’s all grisaille painting. Charcoal drawing is hard but it’s addicting. It’s fussy and sometimes it feels as if the charcoal is actively working against you. But when you look at drawings from a master like Prud’hon, it’s clear there is virtue in charcoal. And, consistent with my entire atelier experience, this virtue seems to be patience. Fantastic! I loved that you said pace it for the long run. Keep up the beautiful work!